Quality & Food Safety — Delivering high standards through testing, measuring, tracking and reporting every single shipment of milk from each farm. Animal Health & Welfare — Ensuring proper animal care. Every member farm participates in a professional on-farm evaluation and verification process on a regular schedule. NDA adheres to the standards in the national Farmers Assuring Responsible Management (FARM) program, a comprehensive animal health and welfare initiative. For more details on FARM, see www.nationaldairyfarm.com. Work Culture & Environment — Promoting farm employee social welfare and a safe, positive and productive work environment. Hundreds of farm employee anonymous interviews are conducted every year by professional third-party companies to identify baseline conditions and opportunities to deploy best practices for improvement. These are done by skilled and objective professionals in the absence of the farmer. Environmental — Managing the farms in a manner that protects the land, water and communities that depend upon them. That is the way of our farmer owners. All of these components were adopted by the farmer owners and have been in practice for multiple years. They are a source for continual advancement and improvement. The underlying principles are setting high standards and minimum expectations for all co-op farmer-members, measuring and evaluating against those standards in objectively validated ways, and driving cycles of continuous improvement through training, tools, coaching and investments in the farms and people. The components of this program are rooted in the farmer owners’ bedrock values and commitment to their community. In addition, the Northwest Dairy Association and Darigold have proudly adopted the U.S. 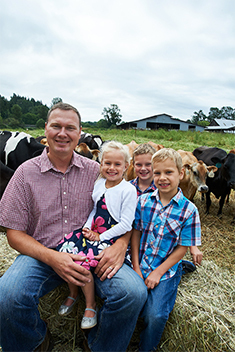 Dairy Stewardship Commitment, affirming to our customers, our consumers and the global marketplace Darigold’s pledge to responsible dairy production as we nourish the communities we serve. For more information about the U.S. Dairy Stewardship Commitment, go to: http://commitment.usdairy.com/.